Spanish (es)Bitcoin: ¿el futuro de las finanzas personales o del delito? Virtual currencies Bitcoin: the future for personal finance or crime? This statement flies in the face of conventional wisdom on cryptocurrencies. 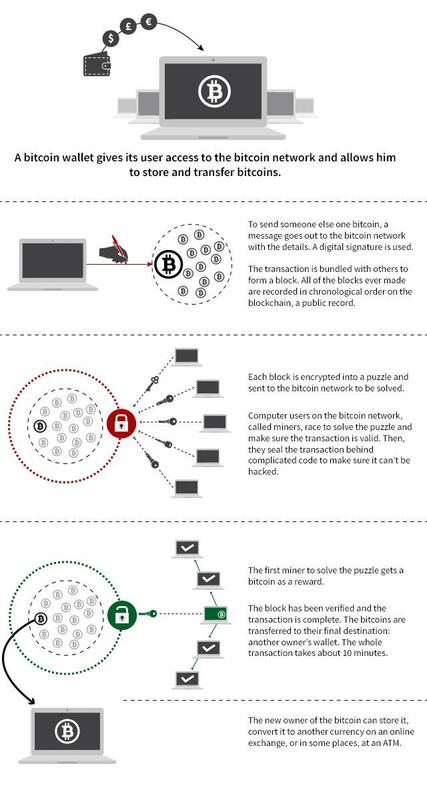 The blockchain, an online ledger for virtual currencies such as bitcoin (see graphic), has been at the centre of sensational headlines involving money launderers, illegal weapons sellers, drug dealers, paedophiles and criminal hackers. These include the Silk Road online black market bazaar for drugs, weapons, stolen identity data and other illegal goods and the Liberty Reserve money laundering racket. Rudolphi should know a thing or two about illicit financial flows. For the last few years his day job as an internet private detective has involved tracking down terrorists and other criminals through the Web. He is convinced that blockchain is more transparent, making it easier to track criminal activity than the traditional financial set-up. When is a bank not a bank? Blockchain is designed to be decentralised, allowing transactions to take place between users without the need for third parties such as banks, or a central clearing system like SWIFT. In one sense, it is a counter-intuitive model because blockchain does away with the need for banks, instead allowing each user to freely operate as their own bank free from external control and irritating fees. The Swiss national sees potential in providing banking services for businesses that use bitcoins. One promising area is escrow accounts – where counterparties to a contract pay an independent third party to hold on to their money and pay it out according to the terms of the contract once it expires. Rudolphi also hinted at cybersecurity and administrative services for business and personal account holders. In essence, his bitcoin bank would organise, store and secure valuable digital data on behalf of clients who do not have the time or inclination to do so themselves. “Hopefully by this time next year Switzerland will have its first ever licensed bitcoin bank – perhaps the first of its type in the world,” said Rudolphi. But not everyone is so sure about the safety of virtual currencies, including the Swiss government which produced a report last year in response to a parliamentary question. The report posted several warnings about how the likes of bitcoin could be exploited for criminal ends. “The use of the bitcoin network offers greater anonymity than the existing electronic payment systems,” the June 25, 2014 report read. “Another advantage for criminals is the decentralised structure of bitcoin”, and the way that “data can be hidden so that prosecution authorities are unable to block or seize assets”. Secrecy can be enhanced by anonymising tools, mixer or tumbler services that scramble transactions making them harder to trace, the use of multiple accounts per user and dark wallets that offer extra concealment for virtual currency users. But the report concludes that the small volume of bitcoin activity that takes place in Switzerland is currently adequately covered by existing legislation. For Luka Müller, a lawyer with Zug-based MME Legal, there are two sides to the virtual currencies coin. On the one hand, “the cross-border movement of e-money laundered assets could get easier” due to the decentralised, anonymous nature of blockchain. Businesses will still need a third party to clear transactions in future, which could be the focus of anti-money laundering regulation. But two people making a private transaction could bypass the need for a bank or other clearing facility to conduct these transactions. “You will never be able to reconcile the conflict between privacy and the regulatory need for identification on a person-to-person level,” he told swissinfo.ch. Conversely, blockchain does make it easier to monitor the path of financial flows. “The mitigating factor is that blockchain is a public transaction ledger, listing the amount and time of each payment, which is publically available,” he said. It is precisely this public scrutiny mechanism that convinces Rudolphi that blockchain is more effective at rooting out criminal activity. All transactions have to be made public so that the community can democratically agree that the books balance. Switzerland’s financial regulator, the Swiss Financial Market Supervisory Authority (FINMA), is looking hard at the system. It raised a warning in May - at the same time that it adapted Swiss anti-money laundering rules to take account of digital payments - that virtual currencies are vulnerable to criminal activity. While Branson did not give out many details on how this would work, he hinted that it could apply to fintech companies that conducted financial transactions on a lesser scale than traditional banks – such as digital currency providers. In the meantime, the Swiss financial sector is showing signs of stepping up its interest in virtual currencies. UBS has been particularly active in blockchain research at its Level 39 think tank centre in London. In May, FINMA approved Switzerland’s first virtual currency trading platform, Ecurex. Guido Rudolphi hopes his bitcoin bank will receive approval from FINMA next year. He is convinced that the virtual currency movement is here to stay. “When people first heard about the internet, many said there was no future in it because they did not see the potential, even though it was huge. We have the same situation with blockchain,” he said. Created in 2008, blockchain is an encrypted programme that acts as an online ledger of transactions. Each block of transactions is linked in a chain, giving participants an overall picture of what is taking place in the system. The programme is designed to be decentralised, allowing transactions to take place between users without the need for third parties such as banks, or a central clearing system like SWIFT. In essence, each user acts as their own independent bank – free from the administration, and associated costs, found in the traditional financial centre. Blockchain can be used to store and transact virtual currencies, such as bitcoin. Each user opens an encrypted ‘wallet’ and sends or receives bitcoin to counterparty users on the network. The potential uses of blockchain reach far beyond virtual currency transactions. The ledger can store and distribute a range of other valuable information – from digital contracts and land deeds to internet domain addresses. Bitcoin: the future for personal finance or crime? Matthew Allen Oct 15, 2015 - 11:00 “Had FIFA made their transactions on blockchain, they wouldn’t be facing all these scandals,” says Guido Rudolphi, who wants to set up Switzerland’s first bitcoin bank utilising the asset transfer technology. “Everyone would have seen who sent the money and who received it.” This statement flies in the face of conventional wisdom on cryptocurrencies. The blockchain, an online ledger for virtual currencies such as bitcoin (see graphic), has been at the centre of sensational headlines involving money launderers, illegal weapons sellers, drug dealers, paedophiles and criminal hackers. These include the Silk Road online black market bazaar for drugs, weapons, stolen identity data and other illegal goods and the Liberty Reserve money laundering racket. Rudolphi should know a thing or two about illicit financial flows. For the last few years his day job as an internet private detective has involved tracking down terrorists and other criminals through the Web. He is convinced that blockchain is more transparent, making it easier to track criminal activity than the traditional financial set-up. “It’s true that there have been a couple of high profile cases,” he told swissinfo.ch. “But could anyone tell me exactly who gave them the change that’s in in their pocket, who had it before them or who will have it in a week?” “With bitcoin you can do that. Of course you will always have a lot of fraudsters, but bitcoin will make it easier than ever to track down those guys - if you understand the technology.” When is a bank not a bank? Blockchain is designed to be decentralised, allowing transactions to take place between users without the need for third parties such as banks, or a central clearing system like SWIFT. In one sense, it is a counter-intuitive model because blockchain does away with the need for banks, instead allowing each user to freely operate as their own bank free from external control and irritating fees. Rudolphi will not give details of how his bank would operate for fear of giving away sensitive information to rivals. “It is too early to say what parts of traditional banking services will be needed by bitcoin,” he told swissinfo.ch. “But bitcoin will redefine banking.” The Swiss national sees potential in providing banking services for businesses that use bitcoins. One promising area is escrow accounts – where counterparties to a contract pay an independent third party to hold on to their money and pay it out according to the terms of the contract once it expires. Rudolphi also hinted at cybersecurity and administrative services for business and personal account holders. In essence, his bitcoin bank would organise, store and secure valuable digital data on behalf of clients who do not have the time or inclination to do so themselves. “Hopefully by this time next year Switzerland will have its first ever licensed bitcoin bank – perhaps the first of its type in the world,” said Rudolphi. Alarm bells But not everyone is so sure about the safety of virtual currencies, including the Swiss government which produced a report last year in response to a parliamentary question. The report posted several warnings about how the likes of bitcoin could be exploited for criminal ends. “The use of the bitcoin network offers greater anonymity than the existing electronic payment systems,” the June 25, 2014 report read. “Another advantage for criminals is the decentralised structure of bitcoin”, and the way that “data can be hidden so that prosecution authorities are unable to block or seize assets”. Secrecy can be enhanced by anonymising tools, mixer or tumbler services that scramble transactions making them harder to trace, the use of multiple accounts per user and dark wallets that offer extra concealment for virtual currency users. But the report concludes that the small volume of bitcoin activity that takes place in Switzerland is currently adequately covered by existing legislation. Pros and cons For Luka Müller, a lawyer with Zug-based MME Legal, there are two sides to the virtual currencies coin. On the one hand, “the cross-border movement of e-money laundered assets could get easier” due to the decentralised, anonymous nature of blockchain. Businesses will still need a third party to clear transactions in future, which could be the focus of anti-money laundering regulation. But two people making a private transaction could bypass the need for a bank or other clearing facility to conduct these transactions. “You will never be able to reconcile the conflict between privacy and the regulatory need for identification on a person-to-person level,” he told swissinfo.ch. Conversely, blockchain does make it easier to monitor the path of financial flows. “The mitigating factor is that blockchain is a public transaction ledger, listing the amount and time of each payment, which is publically available,” he said. It is precisely this public scrutiny mechanism that convinces Rudolphi that blockchain is more effective at rooting out criminal activity. All transactions have to be made public so that the community can democratically agree that the books balance. “With blockchain every normal person can try to track down illegal transactions. You have a whole swarm working on it,” he said. “The longer blockchain gets, the more transparent it becomes and the more people can analyse the data.” “This is impossible under the current banking system. If you want to tap into SWIFT [the global financial clearing system] you have to be a law enforcement agency.” Regulator awakens Switzerland’s financial regulator, the Swiss Financial Market Supervisory Authority (FINMA), is looking hard at the system. It raised a warning in May - at the same time that it adapted Swiss anti-money laundering rules to take account of digital payments - that virtual currencies are vulnerable to criminal activity. In a speech in September, FINMA head Mark Branson said he was considering a new set of ‘light’ regulations for the financial technology (fintech) sector. This would entail setting up a “new licensing category with less stringent requirements than those currently set out in the Banking Act.” While Branson did not give out many details on how this would work, he hinted that it could apply to fintech companies that conducted financial transactions on a lesser scale than traditional banks – such as digital currency providers. In the meantime, the Swiss financial sector is showing signs of stepping up its interest in virtual currencies. UBS has been particularly active in blockchain research at its Level 39 think tank centre in London. In May, FINMA approved Switzerland’s first virtual currency trading platform, Ecurex. Guido Rudolphi hopes his bitcoin bank will receive approval from FINMA next year. He is convinced that the virtual currency movement is here to stay. “When people first heard about the internet, many said there was no future in it because they did not see the potential, even though it was huge. We have the same situation with blockchain,” he said. Bitcoin & blockchain Created in 2008, blockchain is an encrypted programme that acts as an online ledger of transactions. Each block of transactions is linked in a chain, giving participants an overall picture of what is taking place in the system. The programme is designed to be decentralised, allowing transactions to take place between users without the need for third parties such as banks, or a central clearing system like SWIFT. In essence, each user acts as their own independent bank – free from the administration, and associated costs, found in the traditional financial centre. Blockchain can be used to store and transact virtual currencies, such as bitcoin. Each user opens an encrypted ‘wallet’ and sends or receives bitcoin to counterparty users on the network. The potential uses of blockchain reach far beyond virtual currency transactions. The ledger can store and distribute a range of other valuable information – from digital contracts and land deeds to internet domain addresses. Arabic (ar)اقتفاء أثر الأصول المنهوبة.. "فتّش عن المال"!